In Windows Vista, Windows 7 or other Windows OS with Windows Aero feature enabled, when user installs new version of Windows Live Messenger (WLM) such as MSN Messenger in Windows Live Essentials 2009, there tends to be a thick border frame similar to typical apps around the WLM main window and chat window. The window frame, of course, is to demonstrate the Aero transparency effect. In old classic MSN Messenger era style, the main window nor instant messaging chat window of Windows Live Messenger does not have any border frame. Refer illustration below for the differences between two styles of Windows Live Messenger window’s frame, with Aero and without Aero. 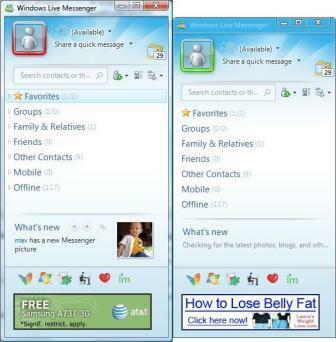 Some user may prefer the classic legacy look of Windows Live Messenger, aka MSN Messenger. To do so, follow these steps to apply the registry hack to remove the Aero transparency window frame or border of Windows Live Messenger. On the right pane, right click on any blank space, then select New in the context menu, and click on DWORD (32-bit) Value to create a new registry value entry. Name the new registry entry as AeroWindowFrameEnabled. Modify the AeroWindowFrameEnabled and set its value to 0 to disable Aero window frame of Messenger (disable Aero effect on WL Messenger). To continue showing the partially transparent window border on Messenger program and IM chat window, set its value to 1 (enable Aero effect on Windows Live Messenger). Close and re-open the Windows Live Messenger main window and/or chat message window for the change to take effect. There is no need to exit from the MSN Messenger program. For user who doesn’t want to edit the system registry directly, just download the following Windows Live Messenger Aero Frame Auto Switcher, and then run the corresponding registry file to merge the value to registry in order to turn on or turn off Aero Frame Window feature in WLM. The ZIP package contains Disable-WLMessenger-Aero-Frame.reg and Enable-WLMessenger-Aero-Frame.reg files. To disable the new Aero style WLM, double click on Disable-WLMessenger-Aero-Frame.reg to return to classic legacy Windows Live Messenger view with no Aero Frame. To restore to Windows Aero layout with partially transparent border frame, double click on Enable-WLMessenger-Aero-Frame.reg instead. Note: When system prompts a warning, click on Yes to continue. Close and open Windows Live Messenger windows to see the new layout style.